Add slapstick style to your phone with this wireless handset. Peeling not necessary. "Hello, room service? Please send up another bunch." Add slapstick style to your phone with this handset worthy of a Marx Brothers gag. It connects through Bluetooth for wireless conversations that keep phone radiation away from your coconut. Just pair it with your device to receive calls and use your favorite voice assistant (like Siri) to make them. Talk for up to 10 hours with the USB-rechargeable battery and know you're helping keep the jungle green thanks to the 100% recycled plastic cover. Made in China. See Banana Phone features here. Compatible with any smartphone via Bluetooth. Features and Functions: 10 hour talk time. 70 hour idle time. Built in rechargeable lithium battery with Micro USB. Qualcomm Chipset/ certified conflict free components. Volume Control. My husband put the banana phone to use immediately and everyone in our family has used it. It may seem a little pricey but it's just one of those gifts that are fun and always make you smile. That smile is worth the $. Great item! I just wish it were a little more realistic and a little heavier sturdier. My husband is a stay at home dad, and he and my daughter enjoy listening to Raffi together, especially the banana phone song. I saw this and had to get it for him. He was more excited about this present than any other present that he got for Christmas this year. Like he jumped up and ran around our house after opening it. We definitely called his brother on the banana phone, and then I had to facetime his brother's wife so that everyone could see the banana phone in action. It's a silly gift, but it's also a lot of fun, and it was bit hit at our house. He said it worked great and loves to use it. Even though I originally bought this as a Dirty santa gift, I wanted it for myself. As a high school teacher you have to get the kids attention somehow. 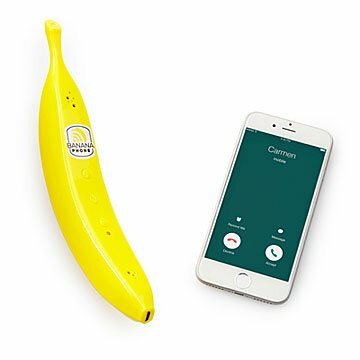 What better way than with a Banana Phone?! I got this as a birthday gift for my husband. We have three boys and they have all heard the banana phone song, so when I saw the phone I had to get it! It brought a huge smile to my husbands face when he opened it! it is a quirky and fun gift! I can guarantee they would never guess what it was before they opened it! I would buy buy this product again- no question! It is so fun, and not something you see super often. Glad I was able to get someone such a unique and fun gift. Priceless when you're at a business meeting and you're talking on a banana phone!